Home School in the Woods is one of our favorite history supplements in our homeschool. 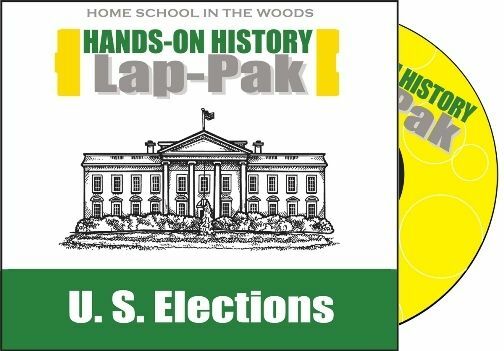 It is always a pleasure when we are given the opportunity to review one of the packages they offer like HISTORY Through the Ages Hands-on History Lap-Pak: U. S. Elections. We received the digital version of U. S. Elections from Home School in the Woods to review. 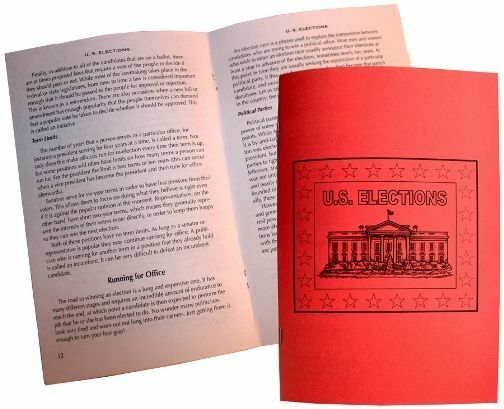 The Lap-Pak includes all you need to create a comprehensible lapbook about all things U. S. Elections. Our youngest daughter expressed interest in learning more about the U. S. government, and since this is an election year I thought this lapbook would be a great yet gentle way to introduce the girls to our government including the branches, the voting amendments, and the election process. I printed two copies of the text. Since we read most history aloud, I thought that it would be nice to give them each their own copy of the text since we normally share. Each of the girls also created their own lapbooks. I thought it was a good idea for them to have their own for future reference. Home School in the Woods allows multiple copies to be printed for students in the same family. We complete two lessons each week. We didn't add any additional resources to the curriculum and used only the information provided in the download. We started our lessons by listening and reading along to the MP3 for the lesson of the day. I didn't find instructions for when to use the text so we used the text the way I saw fit. After listening to the text, the girls completed the activity which correlated with the reading for the day. One reason I found it sufficient to use the program alone was the fact that it provided sufficient amount of information for teaching beginning government to my daughters, ages 8 and 11. Home School in the Woods does a nice job sharing where our government system got its foundation, and why our election methods are such. Before delving into the election process, we learned about the various types of government systems including parliamentary, democracy, and anarchy. We also learned about suffrage and the amendments which make it possible for everyone to vote including Black Americans and women. As always, Home School in the Woods has done a nice job of keeping my learners engaged. The hands-on activities helps them to retain the information learned. I appreciate that the program is more than simply gluing and pasting, but includes valuable information on every page included within the lapbook. It is definitely a resource that the girls will be able to pull out during this upcoming election season as a reference. Are you teaching the election process this year? If so, what are you using?